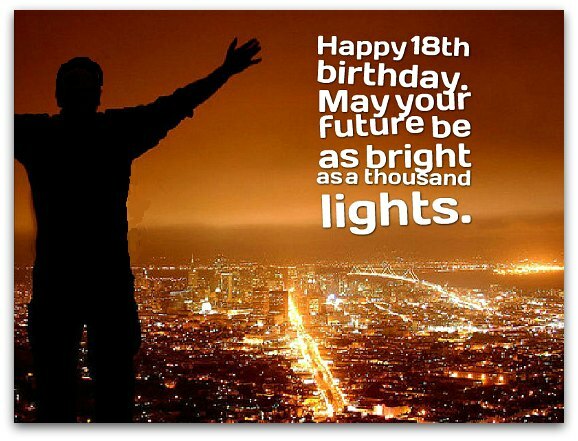 Great 18th birthday wishes can make the birthday boy or girl laugh or weep with joy. The birthday messages for 18 year olds on this page do both, paying a very warm, sometimes humorous tribute to this major milestone. And there are many ways to celebrate the 18th birthday of someone special in words. Because many countries, for example, permit 18 year olds to legally become adults with "adult" privileges — from drinking alcohol to voting — 18th birthdays give you an opportunity to tease the birthday boy or girl about their drinking or inspire them to act responsibly. No matter what 18th birthday greeting you choose, you need to remember that this a BIG milestone, so seriously consider your birthday message options. Don't know where to start? 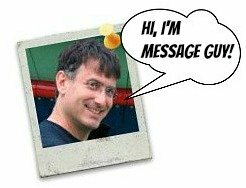 Check out Message Guy Tip #28 for the right route to take here! I hope your 18th birthday is so much fun that it becomes an annual event. Let's act like we're 18 for the rest of our lives. Happy 18th birthday! Happy 18th birthday! I have one piece of advice for you. Whenever somebody gives you life advice, don't just ignore it. Think about it, then ignore it. You're only 18 once, so let’s make your birthday epic. Heck, let’s make your birthday the first of countless special days this year. Any excuse for a party, right? Happy 18th birthday! Wishing you the best in life. That's why it's my duty to tell you that you won't get it...unless you wake up before noon. Turning 18 is the best reason to have a party. But not too much...because you're old enough to get thrown into jail. Happy (sort of) 18th birthday! An amazing life is coming your way. You're on the path to immense joy, adventure and prosperity. Have a happy 18th birthday! You've been waiting 18 years to be legal. Happy 18th birthday and welcome to adulthood. It's your time to fly!